1Start boiling a large pot of water - enough to cover the amount of potatoes your are cooking. Preheat oven to 425. 2Cut potatoes into bite size pieces. 3When the water is boiling, place potatoes in the water. Let it come to a boil again, then allow to boil for one minute. Drain. 4Place potatoes back in the same pot on medium heat on the stove. Stir occasionally for 3-5 minutes. (You are getting moisture out of the potatoes so they will crisp up better). 5Add 1/4 cup olive oil, or other fat of your choice. Butter could be excellent here. Cooks Illustrated recommends duck fat. Stir, then pour onto cookie sheet, spreading into a single layer. 6Add salt, pepper, and herbes de provence. I'd recommend 2 teaspoons of salt and pepper, and 1 Tbsp of herbs. 7Place in oven for 20 minutes. Take out and turn the potatoes, return for another 15 minutes. They should be brown on all sides now. 9When you are ready, place potatoes back in oven (still at 425 or for more speed, broil), and cook for 5 - 10 minutes. Serve immediately. 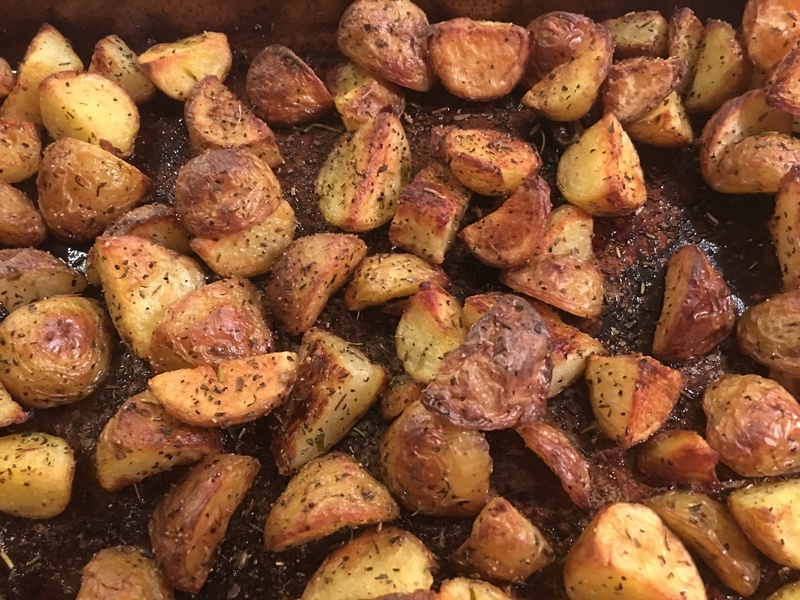 Best roasted potatoes ever!! I used half olive oil/half bacon grease and the result was heaven. Crispy and salty, they were devoured quickly by my family.